You pay just £1.60 per bottle! 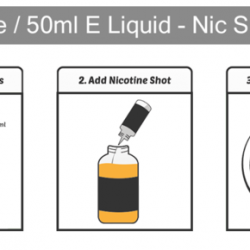 NOTE: This product is High VG unflavoured E-Liquid to boost nicotine levels only. Vaping our salt based nicotine shot at higher nicotine strength 18mg is not the same as vaping 18mg traditional E-Liquid. Our salt based version is much smoother and provides a rush much quicker for longer. Salt based nicotine E-Liquid captures the natural salts found in the tobacco leaf to produce a smooth vape without any harsh throat hit. This allows the nicotine to be absorbed quicker in to the body give you the natural rush as experienced through a smoked cigarette. Rigorously shake mixed bottle and allow to steep well before use.